Dmitriy Nesterkin, a graduate student employee of the University of Arkanas RFID Research Center, has recently developed a new test data management system for use in the Lab. His software application will allow test data to be stored and analyzed from within one system. In recent weeks, the RFID Research Center has also added two Masters of Information Systems (MIS) students to their staff. These two students have successfully extended a software application that was written by former student employee, Jarrod Bourlon. This application will now be able to handle new inputs and outputs. Cisco-Eagle provided the engineering expertise necessary to establish a world-class conveyor system capable of replicating in a 90′ x 30′ space what one would normally find throughout a major distribution center. The test data collection software application interfaces with several different RFID readers and uses photoelectric sensors to begin and end each test run. 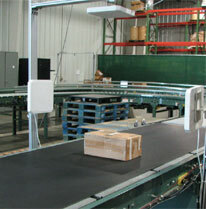 The end result coming from this extended software system will allow for conveyor testing to be completely automated and portal testing will be reduced from a two-man process to a one-man process, allowing the RFID Research Center to have a more seamless data collection and storage system. For more information, visit the RFID Testing Center home page.